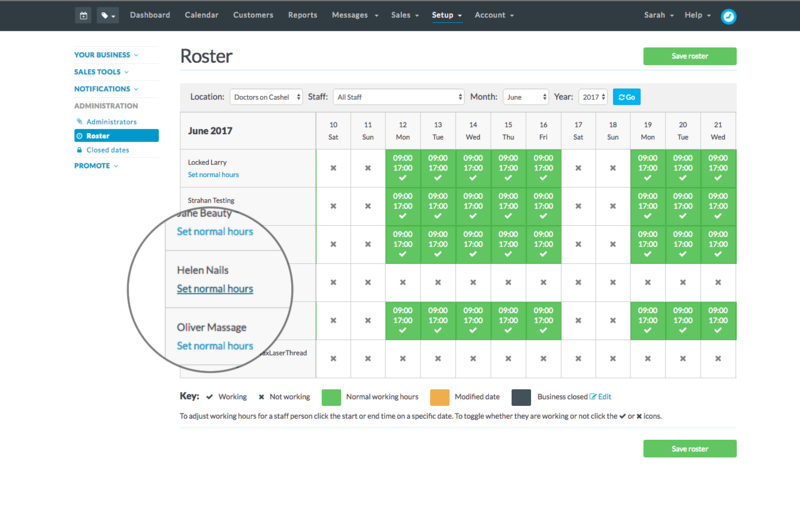 Once you've created a staff member, the next step is to assign the default days and hours the staff member is available to be booked. Set the staff booking frequency. 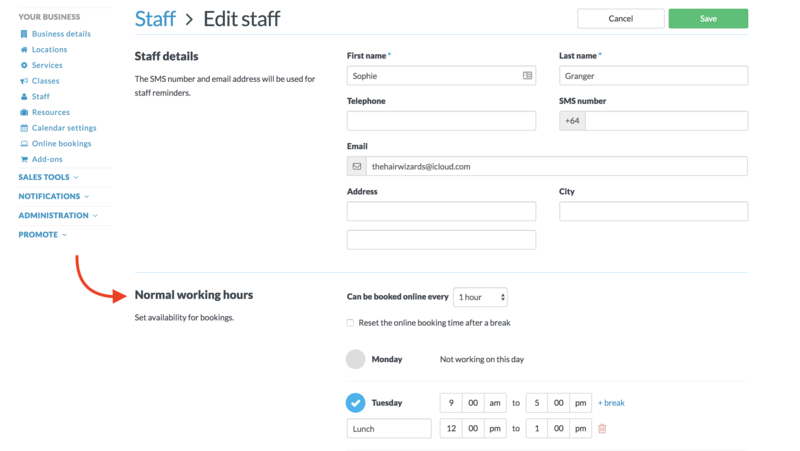 Set the default hours for staff member. Apply those hours to the roster. Check out the video below, or read on to find out more! 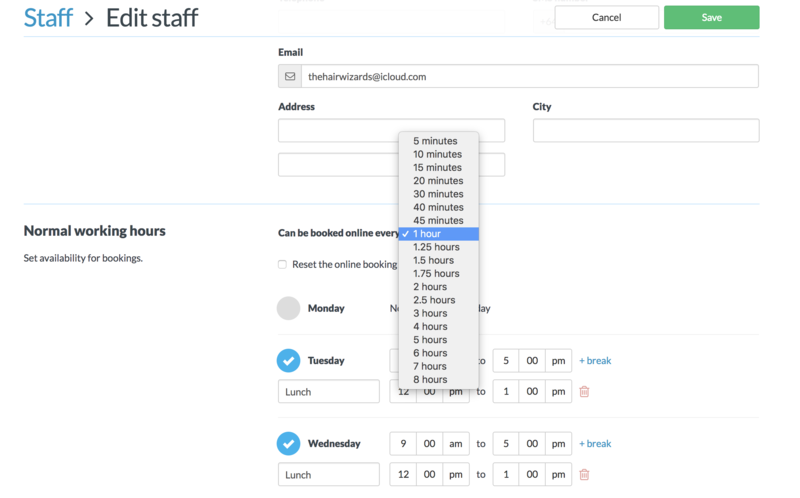 The staff booking frequency controls the interval in which available appointments are shown online i.e. setting this to 15 minutes will show appointment slots at 9:00am, 9:15am, 9:30am etc. This can be adjusted for each staff member individually. If you would like to reduce the number of available slots, choose a higher interval e.g. 1 hour. For more options, choose a smaller interval e.g. 15 minutes. The staff booking frequency is started from the staff member's rostered Start time. When an existing appointment or busy time coincides with a booking slot, then this booking slot will not be available online. You can also determine if you would like any Breaks for that staff member to reset the booking frequency. If this is enabled, the booking interval will be restarted based on the break's end time. Check out our How to set online booking frequency guide for more information. Scroll down to the Normal working hours section. If you only have one location then you will just be shown the days/hours of that location. If your business has more than one location, repeat steps 5 to 7 for each location. If you would like to add regular breaks, like a lunchtime or scheduled meeting, you can add a break to the staff member's normal working day. Check out our guide on how to Block out time with Busy time or breaks (see Related articles). Note: These hours are the default hours and can be overridden on the Roster (Setup > Roster) and by any closed dates added to the business ( Setup > Closed dates). 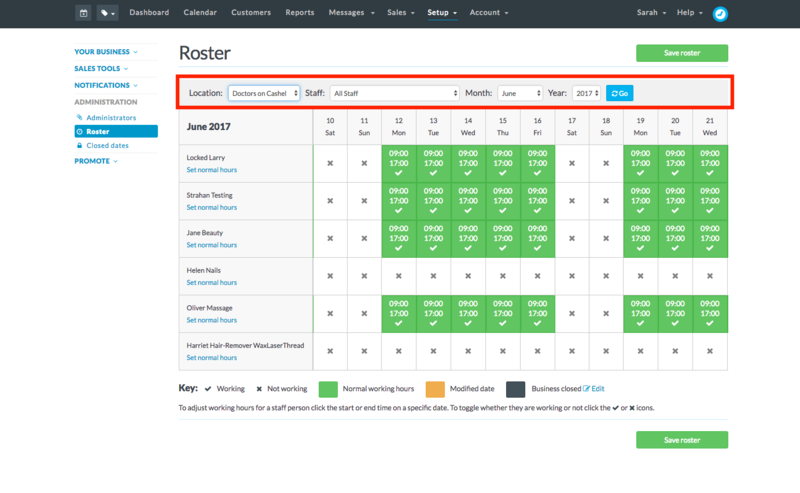 Before a staff member can be seen in the calendar, you will also need to apply those Normal working hours to the Roster. Head to Setup > Roster from the main menu. This will take you to their staff profile, where you can click Save to apply those hours you've just set.